Spring is officially here, and a bit early bringing with it warmer water temperatures and loads of bait. Everywhere you look on the coast you'll see shorebirds migrating, dogwoods and azaleas blooming, fiddler crabs emerging and the marsh beginning to green up. On Sunday visiting angler Kenji Nanamiya and I got on the water in search of redfish, the first Kenji would ever see. 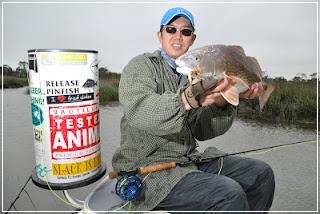 Originally from japan and now living in Australia Kenji and I talked about Tenkara fly fishing, chasing Baramundi and lots of other great stuff including redfishing. Kenji is an accomplished caster and worked hard on the bow as we had cloudy conditions in the morning followed by beautiful sunshine in the afternoon. We landed some nice fish and had some shots at some monsters too. All in all a successful first outing for us landing redfish and flounder on the fly. 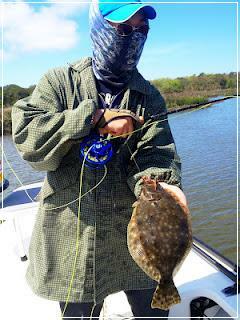 The fishing along the cape fear coast is heating up and the weather couldn't be nicer. With tailing tides beginning in earnest this month, now's the time to book your adventure at sea level! Stay tuned for more fly and light tackle fly fishing.